I just listed 2 AWESOME homes in Creekwood Subdivision in Rogers, AR. Great Neighborhood in Rogers with Pool & Playground! Office, Formal Dining + BONUS ROOM! 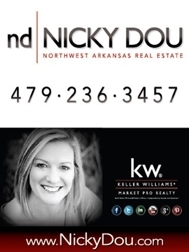 LIKE REAL ESTATE IN NORTHWEST ARKANSAS'S FACEBOOK PAGE! & For things to do in Northwest Arkansas, LIKE 365NorthwestArkansas on Facebook!